When you were shopping around for a home, you likely had a budget in mind before you made a purchase. But how well have you budgeted for the ongoing household expenses you’ll incur after you’ve signed on the dotted line? As a renter, you paid your monthly rent and utilities and were otherwise free from the hassle of worrying about regular maintenance. As a homeowner, you’re now on the hook for all of those little things you never really thought about. One financial planner explained to the New York Times that on average, a homeowner will spend 3.6 percent of the initial purchase price each year in maintenance costs and 4.5 percent for an older home. This means that if you spent $500,000 on your home, you can expect to pay anywhere from $18,000 to $22,500 per year on maintaining your home. Of course, you can always tackle these projects yourself, but that means buying and maintaining all of the necessary equipment to do so. Lawn mowers, weed wackers, hoses, hand tools, protective equipment and storage will all be essential to give your lawn the ongoing care it needs. If you’ve always rented, this is one expense you probably haven’t had to worry about. Handling your own lawn care can be rewarding, but it can also get expensive. Take the time to figure out what you’ll need to care for it and budget accordingly. Regardless of where you live, it’s likely that you will eventually find yourself facing down a pest problem. If you hate the idea of ants, termites, bees, roaches, rodents and other critters making your home into their own, you’ll have to pay for professional pest control services. The initial cost of preventative pest control can run you anywhere from about $150 to $300 depending on the size of your home and the kind of pests you’re looking to repel. After the first treatment, the cost of additional treatments is lower. It’s worth noting that while routine preventative pest control can seem pricey, waiting until you have a full-blown infestation will cost you even more. If there are any damp areas in your home, or if your HVAC system is contaminated, you may have to deal with a mold problem. Worst of all, mold can hide where you won’t notice it until it’s too late—behind wallpaper, in crawl spaces, throughout the air ducts or under the carpets. Once mold has taken root in your home, it can lead to lasting damage as well as health issues for all occupants. It costs an average of $779 to test for mold and toxic material in your home, per HomeAdvisor data. However, with the national average cost for mold removal at $2,155 it’s worth considering an annual test to prevent any dangerous toxins from spreading. You already know that you’ll be paying gas, electric, water and other monthly bills, but have you accounted for rate increases over the next few years? For example, if your region has an unseasonably cold winter, you could be paying a lot more than you planned for gas and electricity to heat your home. Additionally, the cost of basic cable and internet has increased at a rate higher than inflation every year since 2010 and will continue to do so, according to TIME.com. Granted, you can do your part to limit these expenses by using less power or cutting cable out, but these fluctuations aren’t always under your control. While it’s impossible to plan for all of these rate increases, be mindful of what your variable costs could be under different circumstances. The biggest unexpected cost of homeownership is your time. Being a homeowner has a lot to offer in terms of the lifestyle you can maintain and the financial advantages it offers, but one of the tradeoffs is giving up your time to maintain the house. Maintaining your home is extremely rewarding, but it’s also far more time-intensive than simply renting an apartment. 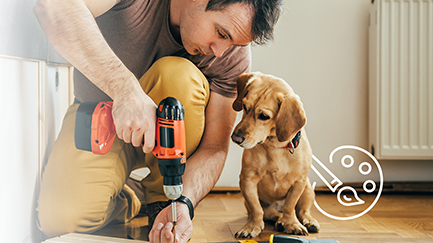 Knowing when to hire a contractor for home improvement projects and when to take a DIY approach will help you achieve a balance between spending money and spending time on your home. A good vision deserves good financing. Realize your masterpiece with a HELOC from Quorum. Get customizable solutions and knowledgeable loan expertise to make the most out of your home. 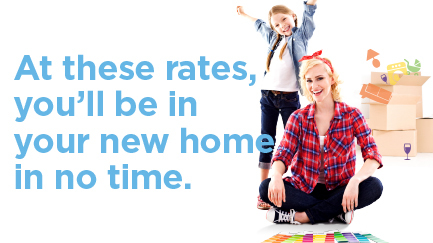 At these rates, you’ll be in your new home in no time. We offer low rates and full access to our expert mortgage consultants, so you have the support you need from start to finish. Does Refinancing Your Mortgage Make Sense?